A lively debate re-ignited in the last week when Balaji Srinivasan, a biotech entrepreneur, made a call for Silicon Valley to secede from the United States. It’s not the first call, though maybe it is the most publicised one, and it shows an industry that is increasingly powerful that is increasingly frustrated by the knee-socks and cardigan wearing conservative global governments that are seen as a constraint or threat to high-tech progress. Now, while that may seem extreme, he’s not the first one to come up with similar ideas and there seems to be a bit of a run on interest in the concept of tech nation states following the debacle that is PRISM and the NSA this year. The problem with PRISM for these big companies, is that it threatens their intellectual property and goes against some of the reasons for their existence, Google in particular. Google, you can debate this all day long, is less about cash and more about trying to change the way that the world thinks. Theoretically, for the better. So when government spies on them, ties them down in regulation, and puts in the foundation of balkanized internet (country firewalls), they become increasingly frustrated. Worse, terrorism, as a global strategist once said, “is the fig leaf on the statue that is surveillance and spying”. In other words, anti-terror is only a small part of why we spy and are spied on. A large part is economic. This has been proven time and again, Boeing vs. Airbus, and continues to this day. For a large tech company that is not only guarding their secrets, but yours as well, this does not sit well. Much speculation in the last few weeks about the Google Barges that have been revealed in the last day or so to be “learning centres”. 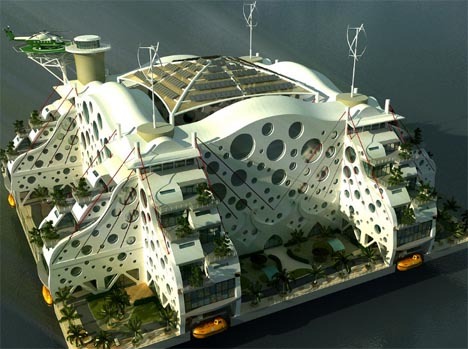 One is being built in San Francisco bay and their are at least another three, well, floating around. These 13,000 plus square foot monsters got all the conspiracy theorists going prior to Google telling us they were effectively “learning centres”. Same conspiracy theorists are refusing to believe this of course, saying that of course that’s what they have to say. The popular theory was that Google had become so annoyed with the continued interference by government that it was building large, floating data centres, that could be water cooled. Once built, you float the barge out into international waters and voila, no more pesky US rules, laws, and regulations. Start scattering those around the planet while introducing advanced security technologies, and all of a sudden the company is just about outside the reach of law. Though maybe not pirates. Whether you believe that or not, the sentiment for that type of setup is definitely there. If you think that building a floating series of data centres is wild, what about establishing a base on Mars? Some of the most powerful technical elite have proposed building a Mars colony. Seriously. However closer to home technology groups have proposed floating themselves out to sea by creating large interconnected islands, again, outside the national borders of any country. “Entrepreneurs and startups must apply to be considered for a spot on Blueseed. If they are approved, they will pay roughly $1,600 per month to live and work on the massive barge. This price may be split between a rental payment and equity in fledgling companies with bright futures, depending on the situation. While I can understand the degree of frustration that the geeks have, being one myself, I am not sure that this 1960’s redux of a super-rich, technically literate, young generation, “run to the hills”, or in this case the ocean, is the right thing to do. Now, that might be because I live in New Zealand, and I, like most of us, were taught that community was a strong part of life. Most of us at some point abandon our country for the OE, but most of us come back. I would far rather see technology and high-tech companies solving problems at home rather than throwing their hands in the air and saying “I’m not going to play anymore.” Generally, in New Zealand, we are far more interested in doing that than leaving the country for somewhere that may or may not be greener. That’s why Smart City interests me so much. It can do a lot, if carefully adopted, to increase all of our quality of life, not just the rich amongst us. While I admire the science-fiction like aspects of living on Mars, living on a floating city, and having autonomous data centres floating around the ocean, the comedian in me can see all the things that could go wrong. Pirates towing off datacentres to Somalia, dystopian floating city Councils making people walk the plank who can’t code fast enough, some hitherto undiscovered life on mars rushing out of caves to eat Google executives, and robots taking over enslaving all the humans in cryo-vats. We are lucky in New Zealand that we can be openly critical of our government and leaders, to their very faces, and that we can literally ring up and make an appointment with our ICT Minister if we want to say something. This is not something that is usual anywhere else on the planet and makes us incredibly unique. Certainly, one of the business opportunities for us must be to provide a home and business location for those disaffected technical elite that have reached the end of their rope with the U.S., U.K. Europe, and other places that have reached the ultimate peak of democracy, total inertia with a hovering camera watching your every move. Regardless, running away and setting up your own country when you haven’t solved your problems at home is a recipe for disaster. Lord of the Flies with technology. Imagine it.